In today's Speak Up on Kotaku, commenter Zombie711 wants Square Enix's DS masterpiece The World Ends with You to end with itself. In other words, here's one of the game's biggest fans explaining why it should never, ever get a sequel. Aww. I like The World Ends with You. A Lot. But at the same time I never want to see a sequel. In my mind The World Ends with You is the closest gaming has ever gotten to a perfect game, and is probably the best example of games as art that I can think of. The story is the best I have ever seen in a game, the music is amazing, the combat works great, and the whole thing just oozes Style. What I like most about it is how it wraps everything up, tells all its story bits, lays down all its morals, and leaves you with nothing untold. And to top it off the developer's found a way to put some legitimately good humor into the game. That is why I would hate to see a sequel. The only way to preserve a game like that would be to rerelease an updated version (a better map would be appreciated) on the 3DS Like what Shin Megami Tensei: Devil Survivor Overclocked, or a cameo role in a Kingdom Hearts game (which is happening). 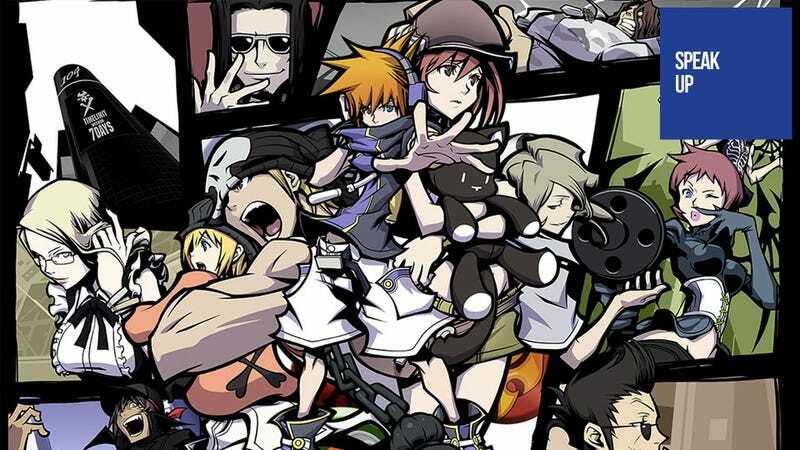 There is no way a game could share the same universe as TWEWY and have half impact as the original. It's like trying to make a sequel to Pulp Fiction, or Ferris Bueller's Day Off. I'm sure it could be done but would you really want it. Would it add anything to the original?